The Missouri University of Science and Technology’s (Missouri S&T's) old events calendar was a complete pain to use. The outdated calendar was difficult for staff to manage. For example, once they posted events, the staff couldn’t edit them after publishing. Students did not find the old calendar very user-friendly, since searching and posting events was a challenge. For example, the search function was ineffective and did not always yield results. Plus, the event submission form was so long that many students abandoned the process. The old calendar received about 200 visitors and 900 page views per week, but 65% of those visitors were people creating events. It took an average of four minutes for people to submit events – or get frustrated and then drop off the system. Less than 100 people per week accessed the calendar to find out what was happening on campus. Because our old calendar was such a pain to use, departments and student groups avoided it. The empty calendar made it look like we didn’t have a lot of activity on campus. Joshua looked into modifying the old calendar, but because of the way it was built, he couldn’t make any meaningful changes without disrupting the system’s core code. He knew that Missouri S&T needed a user-friendly calendar that would make it easy for people to post and learn about events. Joshua looked into several events calendars but felt that most of them had static, clunky interfaces. "We saw that the University of Missouri was using Localist," said Joshua. "Of all the event calendars that we looked at, Localist had the best, most modern interface out of the box. We were also impressed that Localist would give us access to so many expert-level options within their HTML Theme Editor, so we could match our calendar to our website." 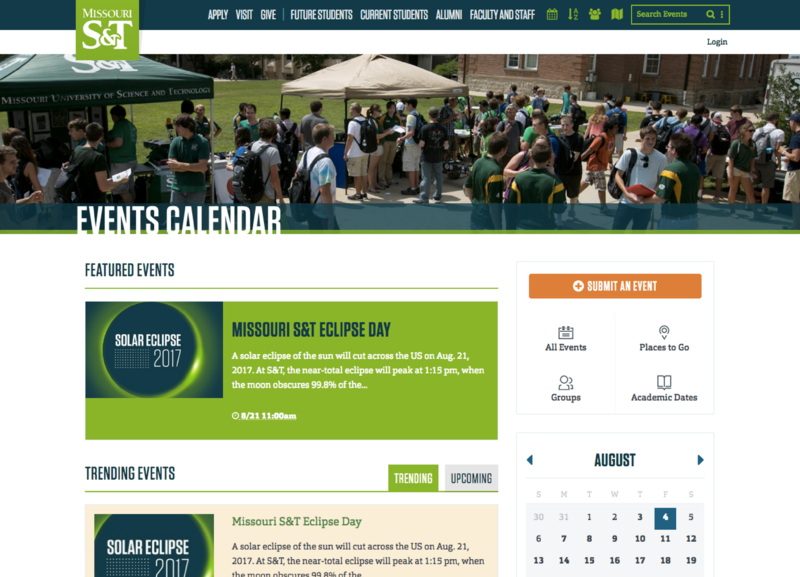 It took Missouri S&T less than two weeks to launch the new calendar – including coding the calendar so it would perfectly match the school’s website. Once the new template was ready, it took just 10 minutes to upload 192 events from the old calendar into Localist. Localist exceeded our expectations and went above and beyond by giving us access to the back end of their system. The implementation went smoothly, and the system is easy to work with. When I had questions about the code, Localist was always happy to help. Missouri S&T launched Localist in January 2016 – right before the winter semester started. In the week before the launch, the old events calendar received just eight visits. In the week after the launch, the new calendar received 1,285 visits. It used to take people more than four minutes to upload a single event to the old calendar – that is if they didn’t get frustrated with the long, complicated form and give up. Now, the average session time is just one minute and three seconds – approximately a 75% decrease. Thanks to Localist’s user-friendly interface, more departments and student groups are posting events. In the semester prior to Localist, people uploaded 192 events. In the semester of Localist’s launch, people posted 856 events – a 345% increase. Joshua feels that Localist is boosting event attendance on campus, as people can now easily find out what’s happening when they look at Missouri S&T’s website. They can also log in through Facebook and quickly RSVP to events that their friends are attending. Our users are adopting the new calendar at an incredible rate. And we expect our traffic to climb even higher, since we did literally nothing to announce that there was a new calendar. People are finding it naturally. In the future, Joshua wants to get more groups – such as the campus theater – to use Localist. He also wants to add event registration to Localist to further boost attendance. Localist is the best out-of-the-box events calendar for higher education and other organizations. Normally, I need to do a lot of maintenance on systems, but I haven’t had to touch Localist since I’ve implemented it. Localist makes it very easy for us to post and manage our events. Are you ready to boost your event engagement?